Another epic endeavor of a recipe beginning with 5 cups of beef stock. It really is important to make your own beef stock because there is nothing nearly as good as home-made on the market. Chicken stock, on the other hand, you can get very good canned (or boxed) versions of and I’m partial to Swanson’s Organic. But most prepared beef stocks taste tinny or fakey or just plain icky. So if you are making something that calls for a lot of beef stock, you really need to make it. As you might suspect, Keller is not going to let you off easy on the stock. For one thing, you’re going to need neck bones which I doubt you will find at your local chain grocery store. Everything else is readily available but it will take you the better part of a day to get it done. You need to roast the bones, char an onion half, roast the vegetables, and simmer the stock for 6 hours. Of course it’s dark and delicious. You can freeze what you don’t need for the Oxtails as I did. I will probably use mine for French Onion Soup. For the Tartine, you braise the oxtails in a fairly conventional way. I love braises and I do them often but this one was tricky. After browning the meat and putting it in my dutch oven and cooking for 2-1/2 hours, I found that all of the liquid had evaporated and the meat had caramelized itself solidly to the bottom of the pan. I mean I could NOT get those suckers out! I rescued what I could and added a cup of my reserved beef stock to the pot and brought it to a boil, which released some of the meat and gave me the liquid I needed to finish the dish. I have no idea what went wrong, but next time I would either check my liquid at some point and add more or add more at the beginning. The other part of the Tartine is sauteed mushrooms and again Keller is vague about important things like how much oil to saute them in. I find it odd that someone who will go to so much trouble to source a teaspoon of chile powder from a specific region in Spain will often just tell you to “heat some canola oil.” Not fair! Another important detail omitted is how much liquid you are supposed to have when the oxtails are done braising, or even how much meat you are supposed to end up with after removing it from the bones. The Tartine was delicious and reminded me of an open-faced brisket sandwich. I fear that my picture doesn’t do it justice but just makes it look like some kind of un-made meat bed. In the end though, this seems like a dish you make when you have leftover braised meat, not one you purposely set out to create from scratch. Would I make it again? 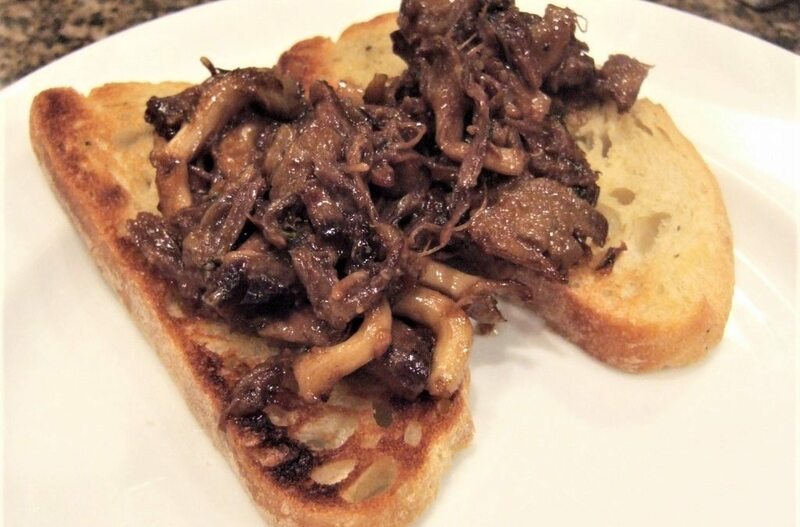 Yes; the next time I have leftover brisket or something similar I will saute some mushrooms, mix in the beef and serve the whole thing on some really good toasted bread. I served this dish with a very delicious, mercifully SIMPLE Spinach Salad with Frisee and Strawberries from Cook’s Illustrated. Generously season oxtails with salt and pepper. Pour 2-3 tablespoons canola oil into a large ovenproof saute pan (or dutch oven) and heat over medium-high heat until hot but not smoking. Reduce the heat to medium, add about half the oxtails, and cook, adjusting the heat if necessary, until browned on all sides, 10-12 minutes. Transfer to a plate and repeat with remaining oxtails. Pour off the fat and return the oxtails to the pan. Add enough beef stock to come halfway up the oxtails. Bring to a simmer, cover, transfer to the oven, and cook until the oxtails are tender, 2-1/2 to 3 hours. Turn the oxtails over and let rest on top of the stove for at least 30 minutes, or up to 1 hour. Remove the oxtails from the cooking liquid, and strain the cooking liquid through a fine mesh strainer; set aside. Remove the meat from the bones, discarding the fat and tough connective tissue (I found I really needed to do this with my fingers to get all of the meat off the bones), and put the meat in a bowl. Season to taste with salt and pepper. (The meat can be covered with the strained cooking liquid and refrigerated overnight. The cooking liquid will solidify; when you reheat the oxtails it may be necessary to add about 1/4 cup water). Heat 1-2 tablespoons of canola oil in a large saute pan over medium heat until hot but not smoking. Add half the mushrooms and cook, without moving them, until golden brown, about 2 minutes. Stir and cook for another 2 minutes, or until browned on all sides. Season with salt and pepper and transfer to a bowl. Cook the remaining mushrooms in the same way. Return all the mushrooms to the saute pan, add the shallots and thyme, and cook for 1-2 minutes, until the shallots soften. Add the butter and cook, stirring, until the liquid the mushrooms release has cooked off and they are glazed with butter, about 2 minutes. Stir in the oxtails, then pour in the reserved cooking liquid, bring to a simmer, and simmer until the liquid has reduced considerably and glazed the meat and mushrooms, about 8 minutes. Slice off the top of the loaf of bread and reserve for another use. Brush the bread generously with olive oil and toast under the broiler. Transfer to a serving platter. Spoon the meat and mushrooms over the bread and scatter the onion slices over the top. Cut into 6 pieces and serve. I’m with you – the liquid just seems to disappear about halfway through. I’ve made this a few times now and I’ve had to add some more stock every time. It’s a tasty dish, it’s just tough to separate all the meat from the fat and connective tissue on the oxtails. Still, it’s gone into regular rotation on my menu. I did this recipe recently as well and it also seemed that all of my liquid evaporated though I left it in the oven for 3 hours and probably should have check on it half way.